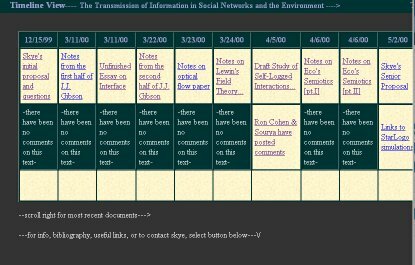 Back in the dark ages before CMS, I tried to move the notes from a thesis project into an online form. It didn’t work very well, but I think some of the texts and comments are still interesting. This site is an experiment. I’m starting research for a thesis on the Transmission of Information in Social Networks and the Environment. I’m hoping that this website will become an integral part of the research by providing a location for discussion, commentary and criticism. Ideally it will augment the verbal discussions I have with people by creating a written record of discussion and the drafting of ideas.